Over the years, I have picked up several Little Golden Books adapted from Christmas entertainment. 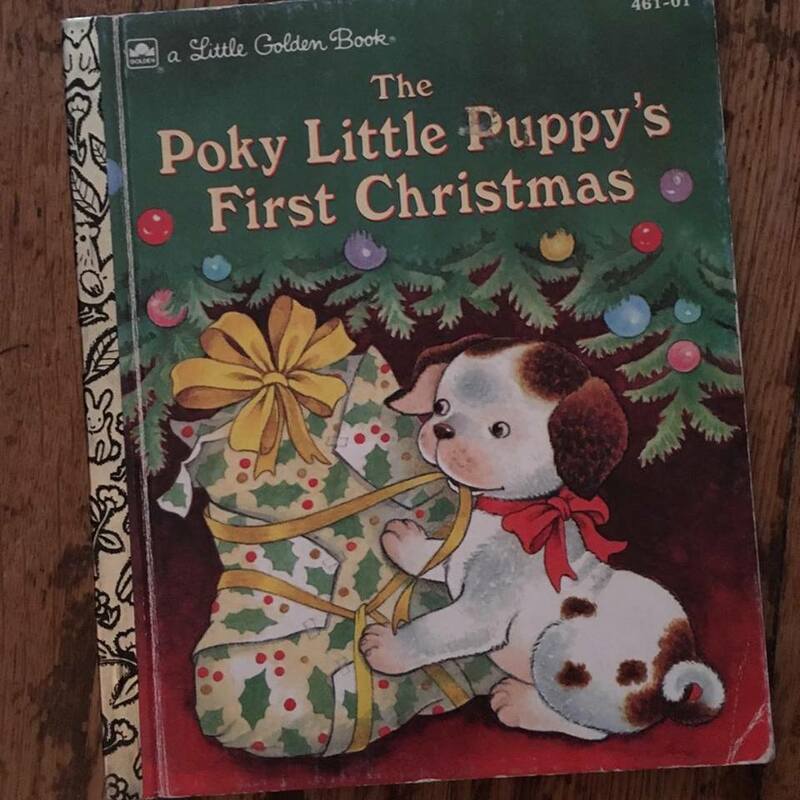 Have you ever seen the 1992 animated TV special The Poky Little Puppy's First Christmas? It aired on Showtime throughout the '90s. 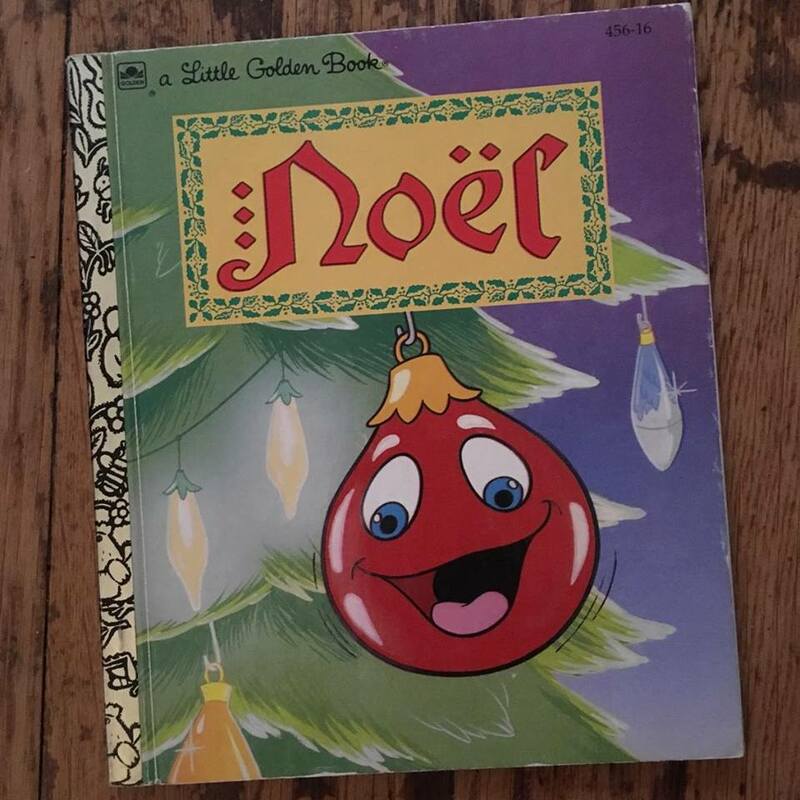 Another Little Golden Book, this one was adapted from the animated TV special Noël which first aired Dec. 12, 1992 in prime time on NBC. This particular special stands out because it was written by Romeo Muller--the same man who also wrote everyone's favorite Rankin/Bass animated TV specials Rudolph the Red-Nosed Reindeer, Frosty the Snowman, and Santa Claus is Comin' to Town, among others. I don't think Noël lives up to the previously mentioned titles but when I saw the book, I had to pick it up. 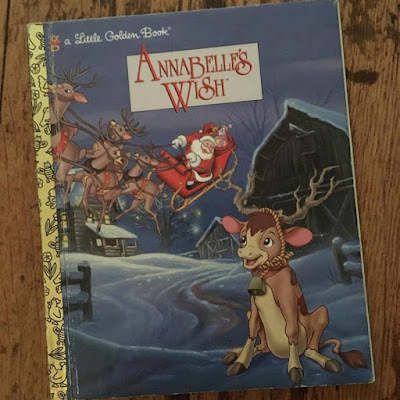 I was excited to see this Little Golden Book. I'm also keeping an eye out for the soundtrack (on Rising Tide/Blue Eye Records) of the 1997 animated TV special Annabelle's Wish. The outstanding soundtrack features country music stars Randy Travis, Nanci Griffith, and Alison Krauss, among others. If you're not familiar, the story is a pleasant rural tale about a calf that wishes she could fly. 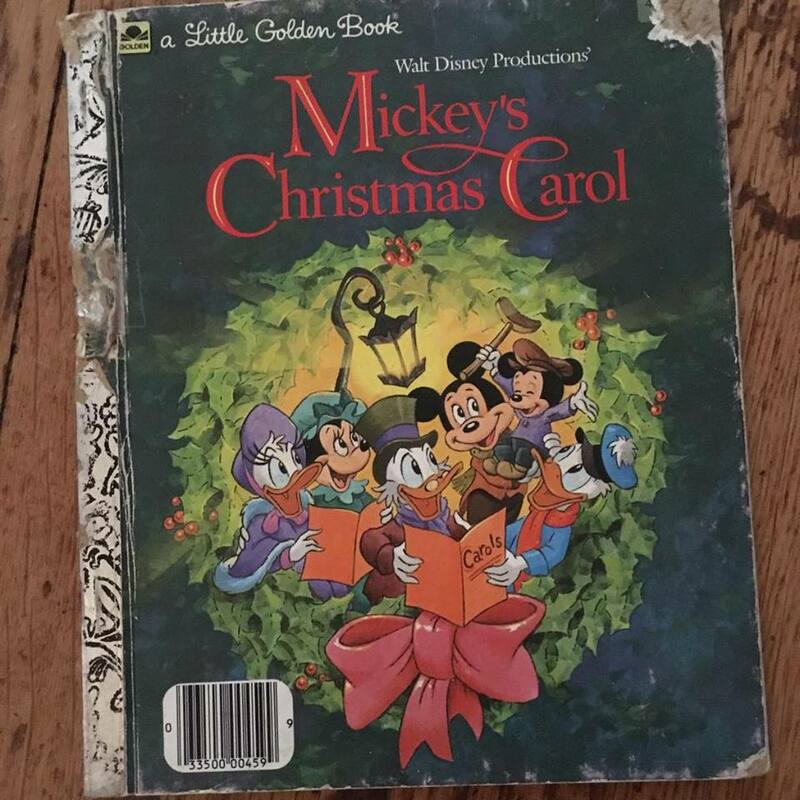 Some years ago, I also picked up this tattered Little Golden Book version of the 1983 animated short film Mickey's Christmas Carol. The Dickens' story is really boiled down to its essentials for this children's book version. It's fascinating to see which elements remain and which details from Dickens' original have been dropped. 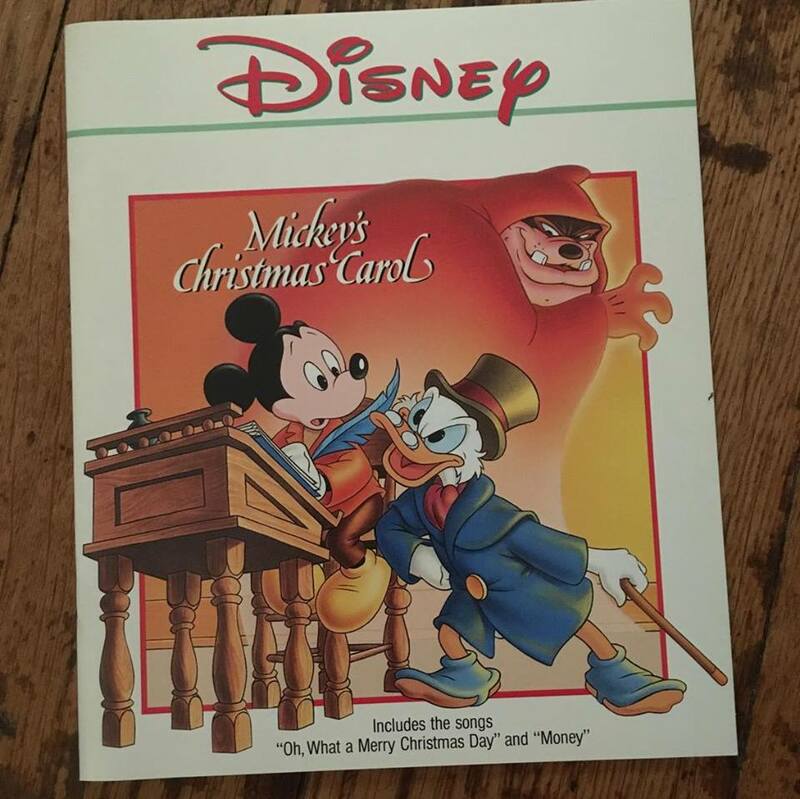 I also have the Walt Disney Records edition of the book adaption of Mickey's Christmas Carol. I picked up this book in a thrift store and it is missing the cassette tape that originally accompanied it. There is no date inside the book for the copyright or even to suggest the printing date. 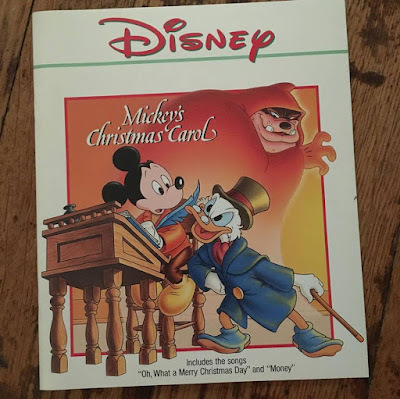 However, the inside back cover recommends other Disney book and record sets which lists The Hunchback of Notre Dame, Hercules, and Mulan, so I'm certain this book came out after 1998. If you're curious, this book is very different from the Little Golden Book edition. The written story is not the same, and the images on every page are different as well. 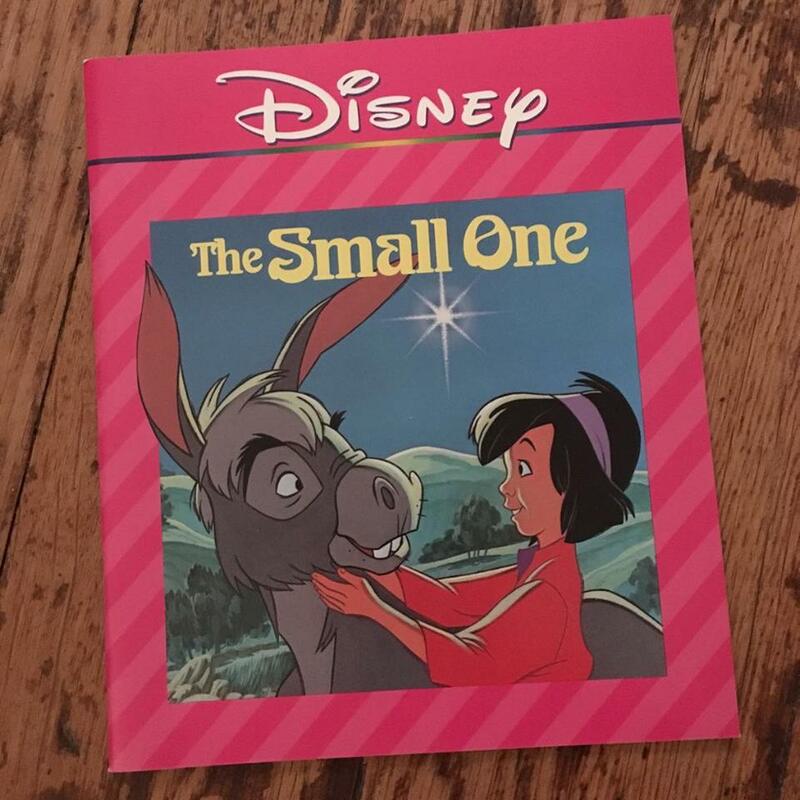 Another Walt Disney Records book I've found is The Small One. It too is missing the cassette tape. (I know it's a cassette because the book jacket includes the date 1987 and doesn't feature a sleeve to hold a 45 record). 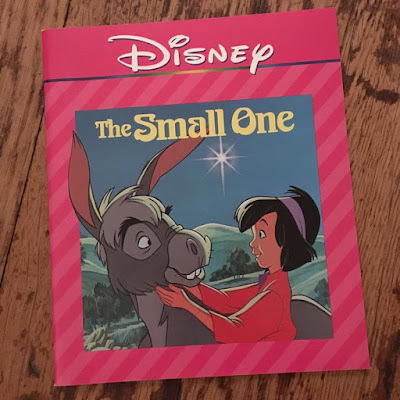 The book is adapted from the 1978 Disney animated short film--which was originally adapted from another book, written by Charles Tazewell. (Tazewell also penned The Littlest Angel, a Christmas story that inspired the 1969 Hallmark Hall of Fame musical, starring Johnnie Whitaker and Fred Gwynne). While this cover isn't very inspiring, the illustrations inside the book are much better. 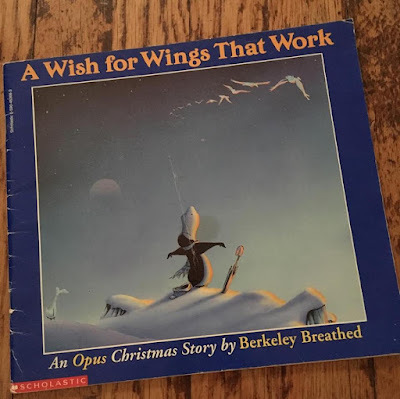 A Wish for Wings That Work is the Scholastic book edition adapted from the animated TV special that first aired Dec. 18th, 1991 on CBS. The characters are from the comic strip Bloom County by Berkeley Breathed. Here, Opus the penguin wishes he could fly. This book is another Golden Book but a softcover edition from 1990 featuring the popular animated characters Alvin and the Chipmunks. The story is adapted from a 1983 episode of the Saturday morning cartoon series. The lesser-known episode "Merry Christmas, Mr. Carroll" has also been released under the title "Alvin's Christmas Carol," and yes, it's the Chipmunk version of Charles Dickens' ghost story. Have you seen this episode before? 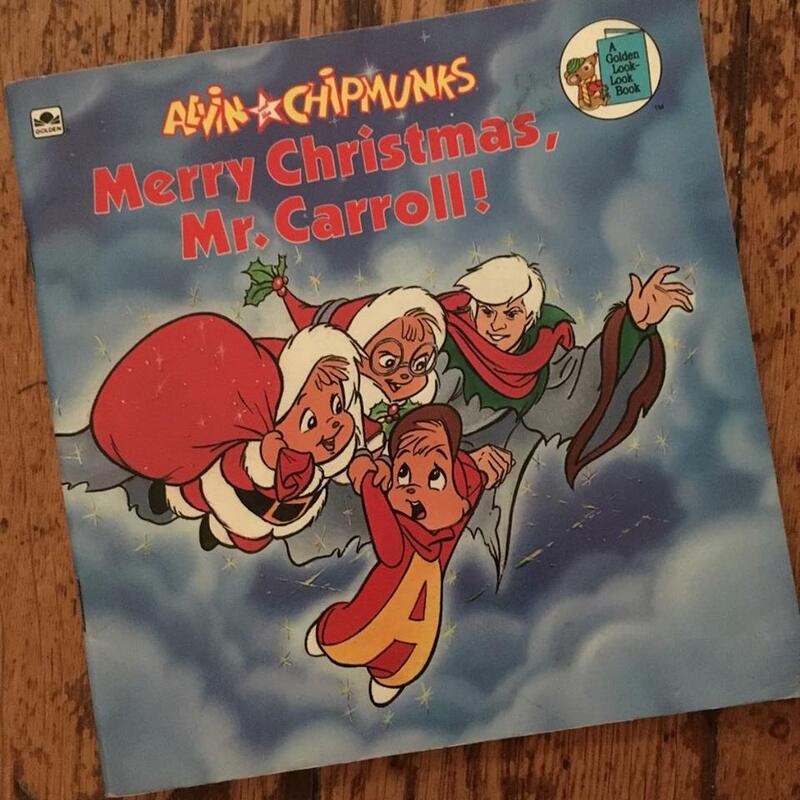 It shouldn't be confused with the more familiar 1981 animated special A Chipmunk Christmas. 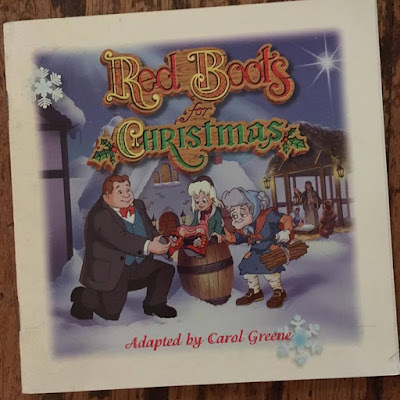 Years ago, I picked up the used book version of the 1996 animated TV special Red Boots for Christmas. The special was produced by the Lutheran Hour Ministries and aired in syndication on TV for years. If I remember correctly, it was advertised that viewers could send for the book version of the animated special for free. Perhaps there are many copies of this book still in circulation. I remember exactly where I found this book many years ago. I discovered it in a thrift store in a small Amish community in central Ohio. The 1979 Kids Stuff Records and book set is incomplete--I don't have the original record. If you can see it on the cover, there is mention that the book's illustrations are left simplified for children to use as a coloring book. Lucky for me, no child has added crayon or maker to the book's pages. Another oddity, the text inside the book is entirely in capital letters--which leads a 21st century-reader to feel like the story is being shouted!? But you know why I grabbed this book immediately, right? 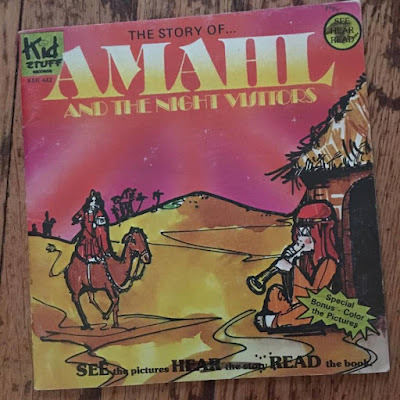 It's the children's book version of 1951's Amahl and the Night Visitors--a Christmas TV special of much acclaim and history. Amahl was the first Hallmark Hall of Fame special, and the very first opera written specifically for television. I also have these two storybooks from the 1985 theatrical release film Santa Claus: The Movie. 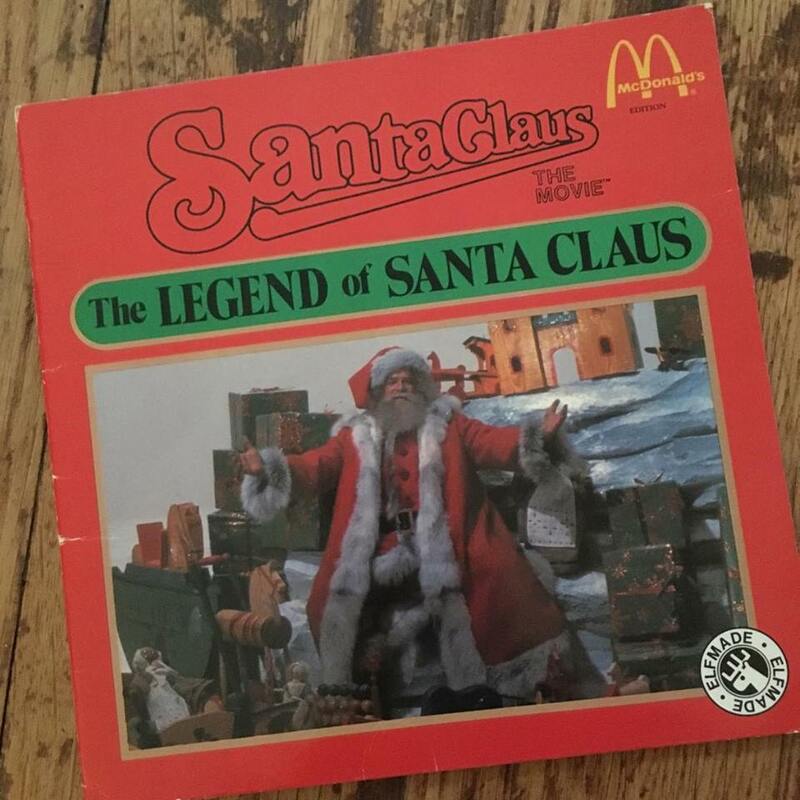 Both were Happy Meal premiums distributed nationally by McDonald's during the holidays in 1985. 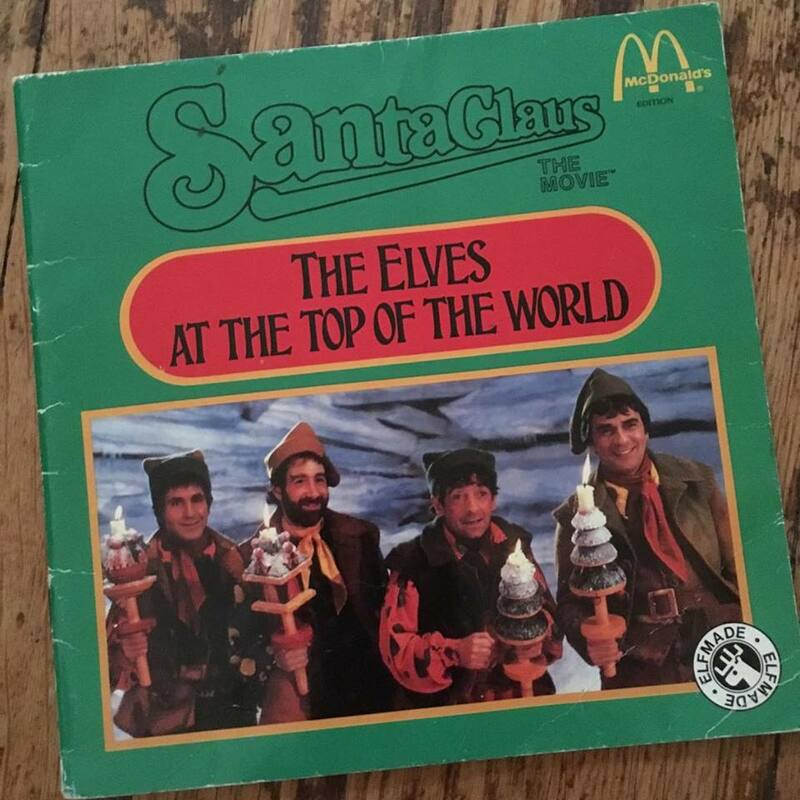 (If you'll remember, the film includes Santa and the young boy Joe eating McDonald's hamburgers). The complete set includes two activities/coloring books that I haven't found yet. 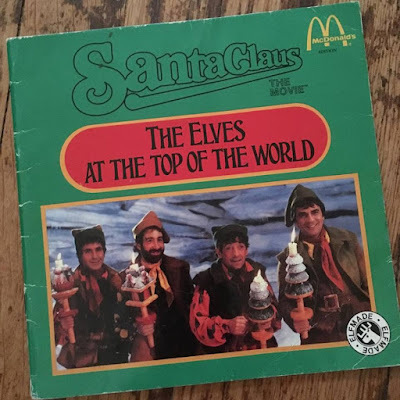 The covers are designed similarly but the titles are "Sleighful of Surprises" and "Workshop of Activities." Have you seen the four book set before? Another book spun from 1985's Santa Claus: The Movie is this hardbound Weekly Reader edition. It is a longer read than the two soft cover picture books (above), however, the photos inside are mostly in black-and-white. 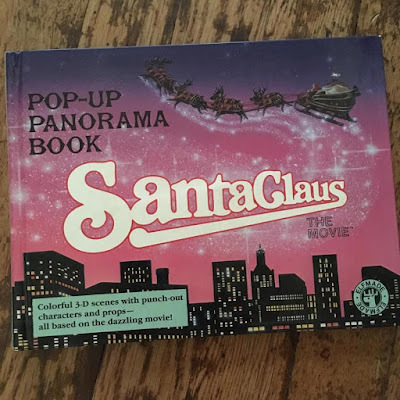 I also found this pop-up book from Santa Claus: The Movie. 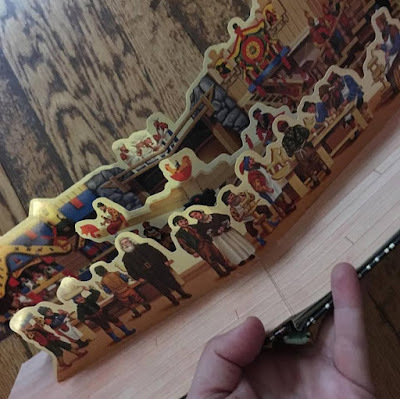 There are four pop-up scenes, including Santa arriving at the North Pole, the elves preparing for Christmas Eve, the elf Patch appearing on TV, and Santa racing across the New York City skies. It's pretty cool, even if it's not the most elaborate or complicated pop-up book I've ever seen. 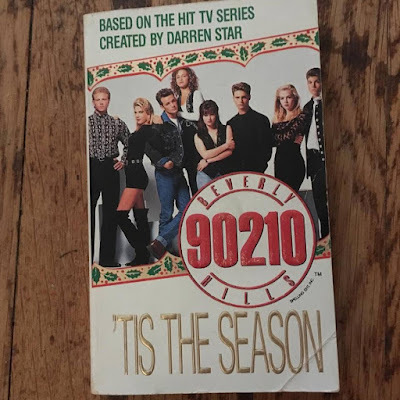 My collection also includes this novelization of the 1991 Beverly Hills 90210 episode "A Walsh Family Christmas" from the second season. 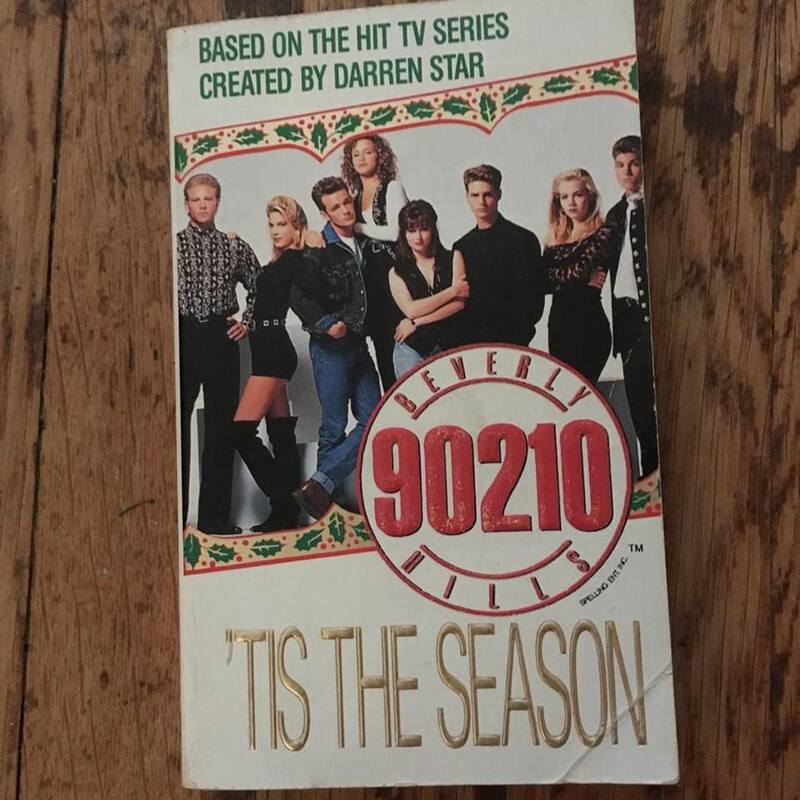 You remember the episode--Steve leaves town to search for his biological mother in New Mexico, and twins Brandon and Brenda experience their first Christmas away from Minnesota. 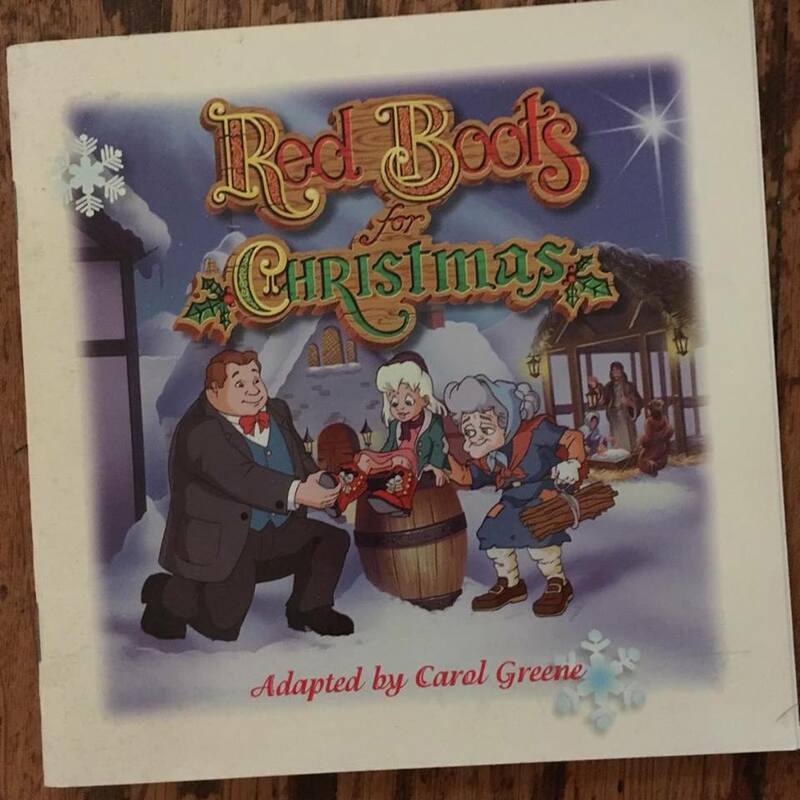 In the end, Brenda invites a homeless man in a Santa suit to join the Walsh family for dinner. Maybe I'll read this one again! Unlike the book above, this story is NOT a novelization of an episode from a TV series. The 1997 book is an original Christmas story written about the characters made popular in the TV series Full House. 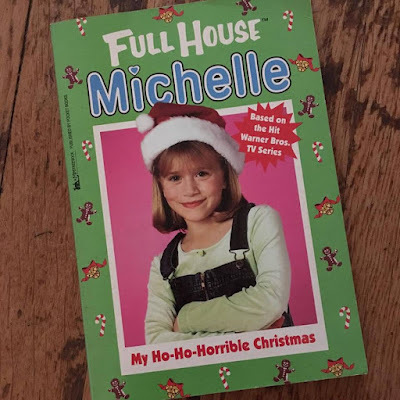 Here, Michelle is nine years old, and she's burdened by her visiting cousin Marshall when he causes her to be uninvited from a big Christmas party thrown by her best friend. I don't recall having ever read it but I'm sure fans of Full House would love it. Do you collect Christmas books too? Have any adapted from film or TV stories? Share your comments below. That Noel one and the Bloom County one... Amazing finds! Well, all of them really, but those two especially are really neat. I love that you are open to any books, makes for an interesting collection. I have a couple of the Golden Books you have. Classics! I have never seen the Noel book looks fun! I still love reading Mickeys Christmas Carol. Yeah, even just looking at the pictures is a real thrill. Of course, the illustrations and photos in all these books are derived from the Christmas specials. 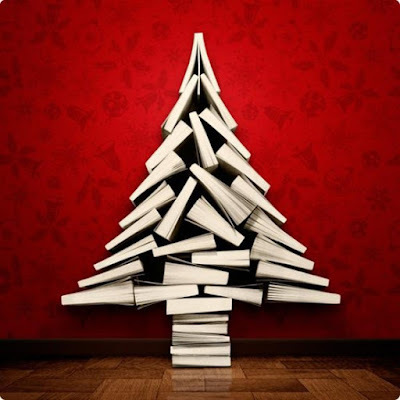 The books are a wonderful extension of the stories. Thanks for commenting! I have collected comic books since the early 80s. At one time my collection grew to about 15,000 books. I decided I had to pare back my collection and specialize sometime in the 2000s. I now have the collection down to 3,000, 600 of which are Christmas related. About half of these are from the Archie publication company but I also have Disney, Looney Tunes, Hanna Barbera etc. 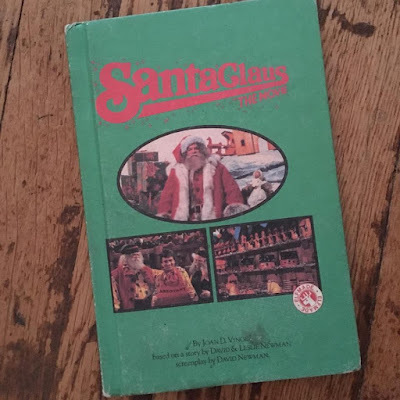 There are also a lot of superhero Christmas titles, Santa Claus Funnies (a title put out by Dell for about 15 years) and quite a few unusual ones (Zombie Christmas, Ms Santa in thong, etc). Christmas titles are getting more difficult to find although last year I was able to get a Three Stooges and a Pink Panther title. That's very fascinating! What's your favorite in your collection? Batman #219. The second feature is called "The Silent Night of the Batman". In it Batman is called downtown on Christmas Eve via Bat signal. He finds out that the police are having a carol sing and ask Batman to join along. Reluctantly Batman agrees and as we see cutaways of Batman signing traditional carols we see crime and tragedy on the streets of Gotham City (Christmas present stolen, blind man mugged, woman contemplating suicide because her husband was killed in the war). However in each case the "spirit" of the Batman comes through (present turns out to be Batman doll which the thief returns, blind man dressed as Batman, husband arrives just before woman jumps). Batman realizes that he has sung all night without one police call and sees a ghost telling him of the incidents above leaving Batman to ponder the spirit of the holiday as he swings away. I read the story every year. In fact about 30 years ago I was reading comics to a blind "pen pal" and performed this story complete with background music and sound effects. He loved it and so did I.